make a whole bouquet and give it as a gift! These would also look great on top of a gift! 1. 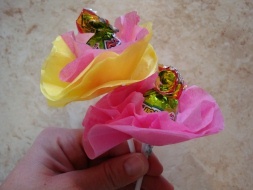 Trace and cut out some circles on to tissue paper, you'll need 3-4 circles per lollipop. Use a mug or small dish to trace. 2. Poke your lollipop into the center of each circle and slide up to the top. Secure your tissue paper with a small piece of scotch tape underneath.